Following tonight’s Criminal Minds season 14 finale, it’s fair that you may have some questions. For example, what’s going to happen with Reid and JJ now that the genie seems to be out of the bottle? New Criminal Minds video – Check out a full discussion of the finale in our video below! Meanwhile, remember to subscribe to CarterMatt on YouTube so you don’t miss our Criminal Minds videos, and be sure to check out our show playlist. 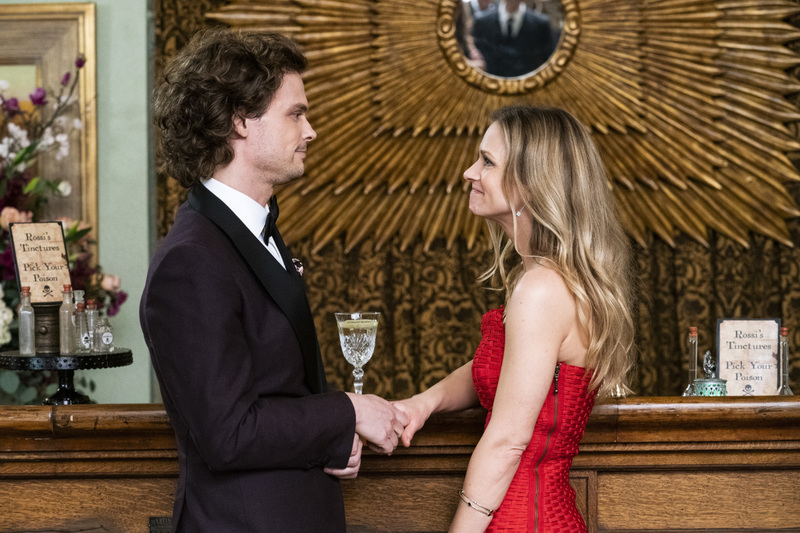 In the closing minutes of the finale, we saw a brief conversation with Matthew Gray Gubler and AJ Cook’s characters, one where he questioned whether or not she truly meant what she said in front of this week’s UnSub. If she did, her confession of love could be a game-changer for their relationship, one complicated by the fact that JJ is married and also has a family. Below, showrunner Erica Messer talks to CarterMatt about that moment, what comes next for the two, and some of her early plans for season 15 and the eventual series finale. (You can check out the first part of our interview with Erica here). CarterMatt – Are we supposed to look at that Reid – JJ moment as something that will be discussed more in season 15? Erica Messer – We have to address it sooner rather than later; you can’t put that back in the bottle. It’s been said and it’s put out there. We had a lot of debate in the writers’ room over whether or not we could really go there with these two and mess up the nice balance that we have. There were a lot of arguments as to why to do it. I think I’m just so protective of both the characters; I didn’t want anyone to look like a bad guy or anything like that. Even when we talked about it with the actors, some people think she 100% meant what she said and some people think she didn’t — she just said what she had to say! Even within our own group it’s up for debate, and I think that the fans are going to be pretty vocal about it, as well. We start the episode with the two playing poker, and he claims that she has a tell; but, then she says ‘I’m a better liar than you think.’ Is that true by the end, where he says ‘truth or dare, did you mean it? — it’s a complicated answer either way. Either she didn’t mean it and that’s hurtful, and if she did mean it, that’s a much bigger conversation. We deal with that in the first two hours of the final ten episodes because we have to. You can’t leave the audience with that and pretend like it didn’t happen. It definitely was a choice to do more of an emotional cliffhanger for the audience this year. We’ve already met a possible Big Bad for the final season in Everett Lynch. How much more of him are we going to see? Michael Mosley is so good at playing this sort of character. He’s amazing! So much of it really depended on who played this character and when it was Michael Mosley, we all said ‘okay, how many episodes can we get him for?’ (laughs). We’re going to be a little bit more serialized than we would be if we were doing a 22-episode order. He won’t be in every episode, but he definitely will be our Big Bad for the year. Have you had a plan for how you wanted Criminal Minds to end for a while, and has that evolved in any way? Have you even settled on anything? I’ve thought about the meta of it. I’ve seen so many series finales where I’m like ‘great, that’s how I wanted it to end’ or ‘no, don’t end like that!’ I’m very aware of how I can’t please everyone, but I definitely have ideas as to how to do it. Some have evolved over the past few months, and some things have sort have presented themselves. We’ll see — the finale hasn’t been broken yet and we don’t shoot it until May. It’s a hard thing. There’s a wishlist of things to do and it just keeps getting longer, not shorter. I don’t know if we’re going to have time to get it all done!